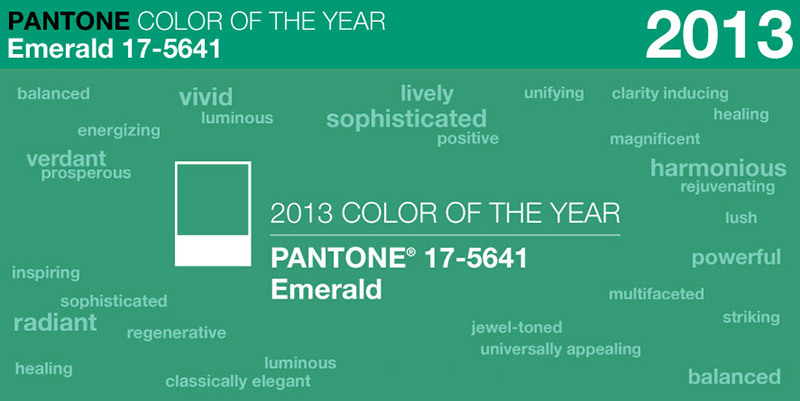 Well ladies and gents, its that time of the year, when Pantone - the world-renowned authority on color and provider of color systems and leading technology for the selection and accurate communication of color across a variety of industries - announces "The Color of the Year" for the upcoming year of 2013. The sophistication and luxury of Pantone emerald will be the inspiration in color palettes across many industries including fashion, beauty, home décor and design. Emerald as been seen all over the spring runways as designers such as Tracy Reese, Zac Posen, and Gucci paid homage; also spotted on celebs such as Katy Perry and Alicia keys. Emerald is a powerful and striking jewel tone, perfect for both women and men's fashion and accessories. It is flattering on all complexions, fresh and rejuvenating. It will be the perfect backdrop for all other hues.